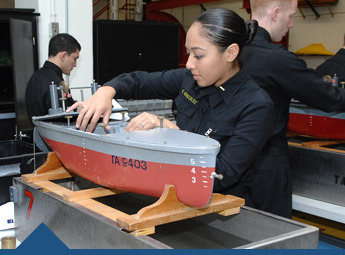 In endeavoring to prepare officers to meet the Navy's present and future needs, the NA&OE Department offers EAC/ABET accredited degrees in Naval Architecture & Marine Engineering (ENM) and Ocean Engineering (EOE) - both dynamic interdisciplinary fields involving the application of engineering principles to the ocean environment. Learn about our courses, facilities, faculty and most importantly our students by exploring our website. Naval Architecture and Marine Engineering combines imagination, artistic instincts, and proven scientific principles, tempered by basic engineering considerations, in designing the means of ocean transportation of the future. The many types of ships, boats and vehicles needed to operate on, under, or above the ocean's surface provide the broad field in which the designer is to work. The naval architect's technical horizon is bounded only by their energy and creativity. The key to unlocking the last frontier on earth lies in the hands of the ocean engineer. 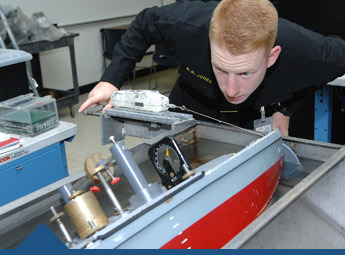 By blending the fundamentals of mathematics, physics, material science, and oceanography with the basic elements of civil, mechanical, and electrical engineering, the ocean engineer is able to apply this knowledge to ocean materials, power systems, acoustics, wave mechanics, life support systems, and the design of a wide variety of ocean vehicles and structures.